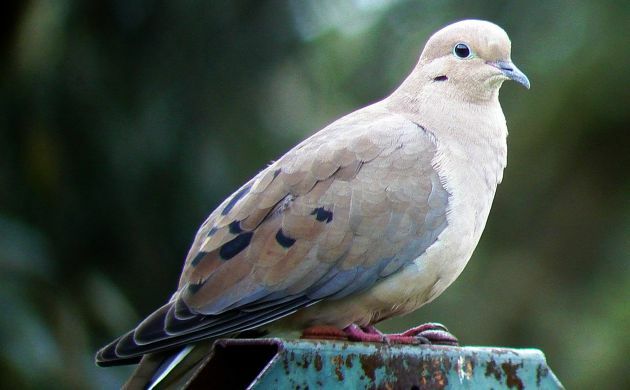 Doves tend to get a bad rap when it comes to birding. A lot of those anti-Columbidae tendencies probably stem from a certain species frequently referred to as a “flying rat”. In raptor enthusiast circles, “Peregrine fodder” is also used, and when a Mourning Dove gets naturally selected by a Cooper’s Hawk, some hawk watchers can’t hide their look of glee. Although some doves get as much respect as the late Rodney Dangerfield, we shouldn’t let commonality cloud our view of this big, beautiful family. Those who ignore the doves would miss out on crazy feathered beings like the Orange Dove, or (gasp!) 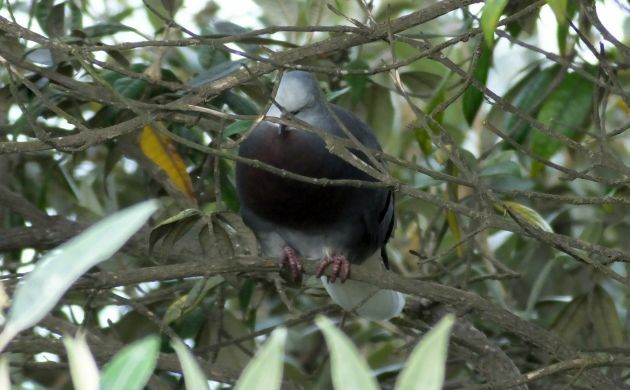 one of the crowned-pigeons. 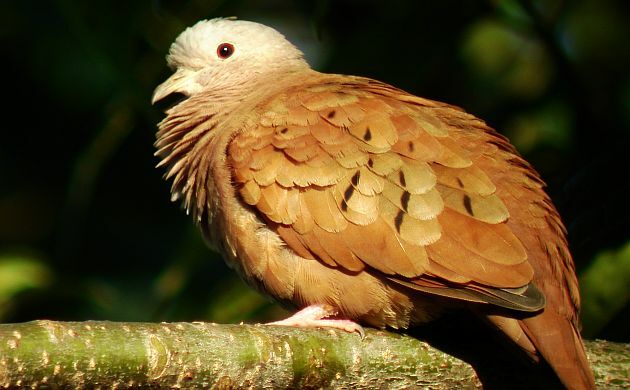 If I had become lacadaisical with all things dove, I would have recently missed out on seeing a major neotropical mega; a ground-dove with a maroon-colored chest. This little dove isn’t your average Ruddy or Common Ground-Dove. 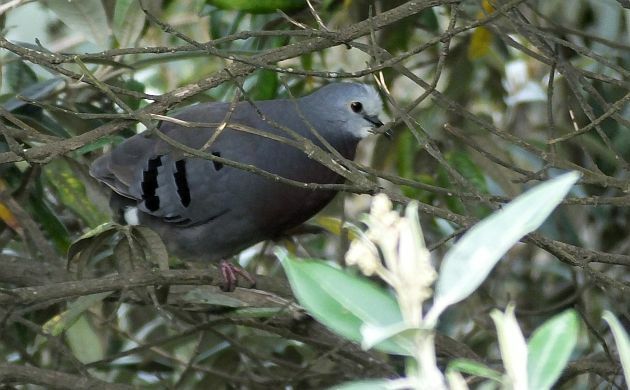 Not only does it look nicer (it looks more like a quail-dove), it’s also super tough to see. In neotropical birding circles, the ability of this ground-dove to avoid detection is pretty much legendary. Bird as much as you want from Mexico to Bolivia, and you could easily never see or hear one for years. Ask most guides who work in the neotropics and this lovey dovey will be on a lot of top-ten lists. Believe me, there are plenty of Ruddy Ground-Doves to look at. As luck would have it, the Maroon-chested Ground-Dove was removed from my target list after my second trip to Costa Rica in 1994. I was hiking up Chirripo Mountain, and while walking through seeding bamboo, saw a bunch. No, not just one or two but something like 15 or 20. I naively thought, “Oh cool, I was hoping to see Maroon-chested Ground-Dove.” but was probably more impressed with lifer Resplendent Quetzal, Wrenthrush, and other species seen the same day. 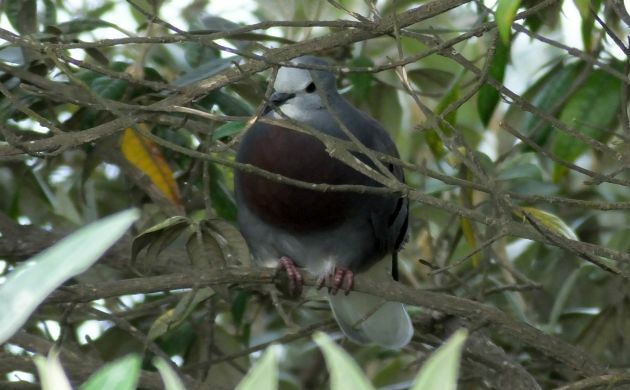 Little did I know that between 1994 and 2014, I would see dozens of quetzals and Wrenthrushes in Costa Rica, and large eagles, Amazonian Parrotlet, and hundreds of other fine birds in South America, but another Maroon-chested Ground-Dove? Not a chance! At least, not a chance until last Sunday. The week before, Ernesto Carman and Pablo Siles heard two Maroon-chesteds calling in the cold morning on Volcan Irazu. With their gracious directions, Robert Dean, Susan Blank, and I made a try for the ground-dove. Since we would also be in the same area for Unspotted Saw-whet Owl (another rare one), we tried for that one first. After hearing a few unseen Unspotteds and shivering in pre-dawn, 11,000 foot cold air, we made our way to a hoped for rendezvous with the dove. The air was kind of thin up there. Sure enough, just after dawn, a Maroon-chested Ground-Dove started calling. It’s voice carried for at least 300 meters in the still morning air and that was a good thing because it wasn’t exactly next to the road. After scanning from the car and staring into roadside habitat in vain, we accepted that a hike up to the bird was necessary (I’m not too eager to hike up steep hills at an air thin altitude of 10,000 feet ). 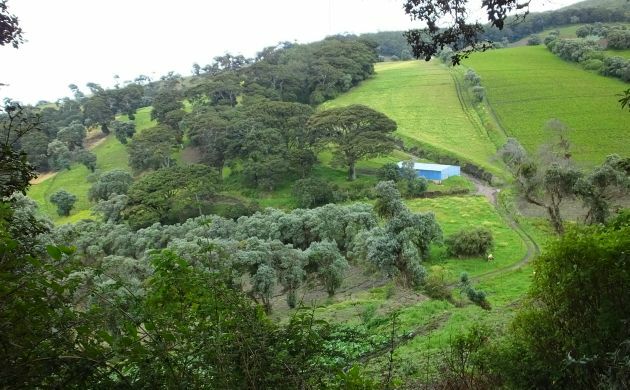 Fortunately, a local farmer was there and was happy to give us access to his land, so off we went. A side view of the bird. We also glimpsed a female, and heard one other calling individual. Since there was some seeding bamboo just down the road, hopefully, this mega ground-dove will hang around for more birders to see it.